If your like most homeowners you have probably tried a deer repellent product before with varying levels of success. While all deer repellents work to an extent they all have their strengths and weaknesses when it comes to protecting your garden. In order to achieve maximum effectiveness with deer repellents, we recommend that you either rotate which products you are using or use two different deer products at the same time. First, lets quickly define the different types of deer repellents. While there other solutions, such as physical barriers and sprays that irritate a deer’s nasal passage, we are going to focus on the two most popular types of deer repellents in this blog. 1.) 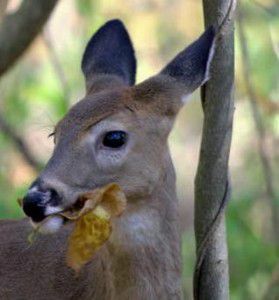 Those that attempt to confuse a deer into thinking a plant isn’t safe to eat by masking or changing the smell of the plant. 2.) Repellents that emit a smell associated with a predator. No matter what brand of product you choose, deer will in most cases attempt to eat the plants you spray eventually. This sometimes happens due to not keeping up with a repellents recommended reapplication intervals, or it might be because deer have adapted to the repellent’s smells. This is why rotating the brand of repellent you use, providing it is using different ingredients, will help to confuse the deer. Recommended Combinations: This strategy would be most common with two different spray products. For example, try rotating Liquid Fence (garlic and egg solid based) and Deer Solution (cinnamon and egg solid based). Using two different types of repellents will create the best line of defense against deer, since you are using both a smell “masking” spray and a predator-centric repellent. This strategy is effective not only because you are using two types of repellents, but it also allows for more forgiveness in application. When plants are growing rapidly, a spray product has to be reapplied on the new growth to maintain optimal effectiveness. Granulated repellents, which typically are based from a predator scent, don’t need to be applied with new growth since they are not being applied directly to the plant; however, they can loose some effectiveness after a heavy rainfall. PredaSCENT and Deer Solution – Deer Solution is a spray that masks the smell of your plants while PredaSCENT is a coyote urine based PEGG that scares deer away. The weakness of the Deer Solution product is that it needs to be reapplied after a hard rain or with new growth. The strength of the product is that it is easy to apply regardless of where the plant is, just spay it on the foliage of the plant. PredaSCENT’s strength is that it is water activated, so heavy rain is beneficial. If your not going to receive rain you need to water the product initially to dissolve the gelatin capsule to activate the coyote urine. The weakness of the product is it has to be applied around the perimeter of your plants. If your plants are scattered around your property more PEGGs will need to be used to achieve maximum effectiveness. Sweeney’s Deer Repellent and Liquid Fence – Sweeney’s Deer Repellent is a granulated repellent that comes inside a weather protected capsule that is staked into your garden bed every 4-8 feet apart. The advantage of the product is it last for the entire growing season and is weather proof (rain resistant). The product’s weakness is its dependence on wind to spread the “fear-factor” smell throughout your garden to ward off the deer. Liquid Fence’s weaknesses and strengths are the same as aforementioned Deer Solution. The only difference is the smell of the product. By combining Sweeney’s Deer Repellent with a spray product you don’t have to worry about spraying new growth right away as the Sweeney’s Deer Repellent will provide a second line of defense. However, I wouldn’t get to lackadaisical. Nothing is 100% effective! Both strategies outlined above have provided many of our customers with better results. If you want to take it even a step further, I would recommend combining both approaches outlined above!